Greetings from Juniper Level Botanic Gardens, where a low temperature of 26 degrees has left the garden feeling and smelling like fall. I was just noticing the strong smell of chrysanthemum foliage yesterday, whose oils were released after the recent cold snap, like collards after a frost. So, where did the year go? It seems like just yesterday we were enjoying epimedium flowers and now the early hellebore season has already begun. As we age, it seems like the world spins faster on its axis every year. I apologize for being silent so long, but I’ve been sequestered away in our underground horticultural bunker, writing the 2014 Plant Delights Nursery spring catalog. Now that the main text is complete and the photos have been selected, I’m playing catch-up on long overdue writing. We’re very excited about our 2014 catalog, which will head to the printer in a few more weeks and will subsequently arrive at your home shortly after the first of the year. We’re wrapping up our 2013 plant shipping season, which ends the week of November 25-29. Plant shipping will resume in mid-February, weather permitting, but if you encounter a horticultural emergency between now and then, please let us know and we’ll see if we can help. It’s that time of year to consider gift certificates for your favorite gardener or that hard-to-buy-for family member. You can find them online here. 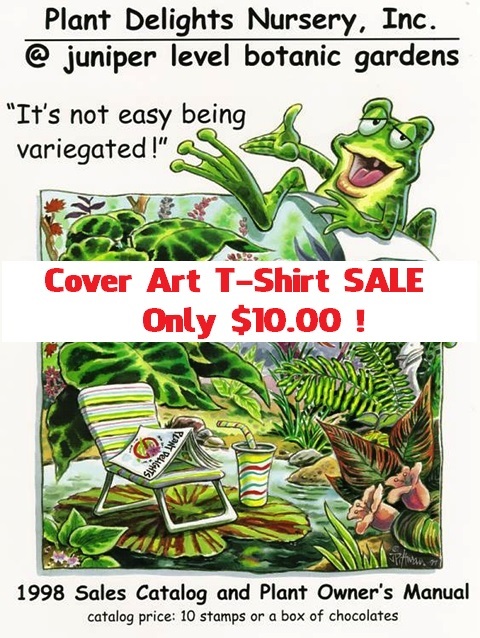 We’re discontinuing our t-shirts so from now until the holidays we are having a 50% off sale. We hope you’ll check out our selection for the gardeners in your family at T-Shirt Sale! When they are gone, they are GONE! Order yours while supplies last. As we transition from fall to winter, we’re excited to see the next gardening season begin. 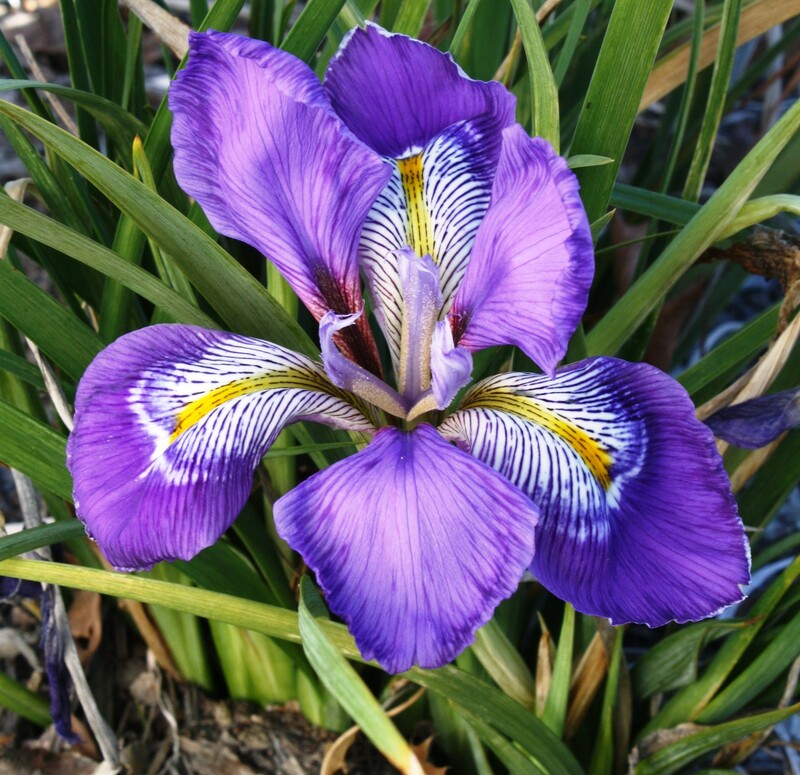 One of the first signs of late fall is the winter-blooming Iris unguicularis. We’ve always considered ourselves to be at the northern end of where Iris unguicularis is winter hardy, but as more and more success reports come in from places like Kansas City, we realize we have severely underestimated the range in which this gem can be cultivated. During the fall rain lily flowering season, we discovered there was a mixup in our stock of Zephyranthes grandiflora, which had been infiltrated with Zephyranthes rosea…a smaller and less winter hardy pink-flowered rain lily. If you got a Zephyranthes grandiflora from us in 2013, you may have received the wrong plant, so please contact us for a credit or refund…very sorry. The latest name revision to come about because of DNA research was to the aroid genus, Alocasia, when the odd, deciduous Alocasia hypnosa underwent re-assignment therapy to become the only member of the genus Englerarum. Englerarum hypnosum is an odd bird, growing on limestone rock outcrops from southern China south into Thailand. You may read more at here. Speaking of plant name changes, one of the funniest parodies we’ve seen regarding these changes has been floating around YouTube, so if you haven’t seen it, here’s the link. It probably won’t make much sense, however, unless you’re a plant name geek. In the “you just can’t make this stuff up” department, a newly built Premier Inn in England reacted hastily when it was pointed out, on social media, that a landscape firm with an obviously wicked sense of humor, had installed new plantings around the hotel that resembled male genitalia. Instead of embracing their unexpected publicity, uptight corporate executives ordered the offending plants removed. There was huge news from the nursery industry recently with the merger of the two largest industry associations, the OFA (Association of Horticulture Professionals), and the ANLA (The American Nursery and Landscape Association). As of January 1, 2014, the new organization will join all members of the horticultural supply chain together under one organization called the American Horticulture Association…aka American Hort. American Hort’s mission will be to unite, promote, and advance our industry through advocacy, collaboration, connectivity, education, market development, and research. The headquarters will be in Columbus, Ohio, with a government relations office in Washington DC. In other nursery news, two of the country’s largest nurseries have joined forces. Color Spot has purchased the last three, recently bankrupted, Hines Nursery locations (270 acres in Rainbow, California, 1,100 acres in Winter, California, and 1,000 acres near Portland, Oregon). Reportedly, the deal to buy Hines was finalized last October, but not announced until this October…nearly a year later. Color Spot president, Jerry Halamuda, said the management team at Hines would remain, just days before they all departed. With this acquisition, Color Spot is now the largest nursery/greenhouse operation in the country with just over 18 million square feet of greenhouse crop production and 2,500 outside acres…more than double its next closest rival, Kurt Weiss Greenhouses of New York. That’s seriously big, but then when you sell to box stores, you need lots of plants. Congratulations to our friend and native plant guru, Jan Midgley of Alabama, on the publication of her new book, Native Plant Propagation. I had a blast reading through her 100+ page manual and learned quite a few new tips that we’ll be using here at the nursery. You can purchase your own copy directly from Jan, by emailing her at jwildflwr@aol.com. Happy birthday to California plantswoman, Ruth Bancroft, who celebrated her 105th birthday on September 5. For those who have never visited, Ruth’s cactus and succulent garden in Walnut Creek, California, was the first garden ever selected for preservation by the Garden Conservancy. Congratulations also go out to our friend, Ozzie Johnson of Marietta, Georgia, whose plant introduction, Mahonia eurybracteata ‘Soft Caress’, was named the 2013 RHS Chelsea Flower Show Plant of the Year! Many customers who visit our gardens are enamored with the dwarf loblolly pines, which were grafted from the amazing specimens at the JC Raulston Arboretum in Raleigh. These dwarf pines are almost never available for purchase since grafting them is extremely difficult. The most successful grafter of these in Texas had excellent success this year and consequently, they are available for a short time from our friends at Yucca Do Nursery. Don’t miss this rare opportunity to buy one. Since our last newsletter, we’ve lost several friends, including some giants in the horticulture world. PDN lost a dear friend in mid-October with the passing of Janie Bryan, 57, following a decade-long battle with breast cancer. Many gardeners knew Janie through her work running the Index Seminum seed exchange for the NC Botanic Garden in Chapel Hill, where she worked for 25 years. Janie handled her illness and impending death with a tremendous amount of grace, and I’ll treasure the time we had to chat through the years, most recently at last year’s PDN open house. Our thoughts go out to her husband, son, grandson, and other family. The dahlia world suffered a huge loss in late summer with the death of Ted Gitts and his wife Debbie, both 59, who passed away after a tragic car accident. Ted and Debbie owned the Oregon-based mail order nursery, Swan Island Dahlias. Swan Island, the largest dahlia farm in the country and perhaps the world, is known not only as a retailer, but as a breeder and introducer of dahlias. Ted’s parents had purchased Swan Island Dahlias 50 years ago so Ted, along with his brother Nicholas, was part of the second generation of family running the business. October also saw the passing of Welch plantsman, Ray Morgan, whose 2007 book, Impatiens: The Vibrant World of Busy Lizzies, Balsams, and Touch-Me-Nots, took our knowledge of impatiens to a new level. Ray was a retired nurseryman and the holder of the UK’s National Collection of Impatiens. Also overseas, we lost one of the giants in the variegated plant world with the passing of Japan’s Dr. Masato Yokoi, at age 82. I had the pleasure of Dr. Yokoi’s visit in the 1990s, when he was taking photos for his book, Variegated Plants in Color, Volumes I and II. Dr. Yokoi was a retired professor at Chiba University and one of the most respected people in Japanese horticulture. One phone call from Dr. Yokoi could open the door to even the most secluded plant collector. The plant world is so much richer for his contributions. Finally, this fall (September 20) also saw the passing of Jim Van Sweeden, co-founder of the world-renowned landscape architecture firm, Oehme and Van Sweeden. Jim was preceded in death by his business partner, Wolfgang Oehme, less than two years earlier. Jim was the polished front man for the firm, originating the concept of the New American Garden which featured large sweeps of perennials, especially ornamental grasses. Jim was a highly honored designer (ASLA Design Medal 2010) and writer, whose literary works include Bold Romantic Gardens (1990, co-authored with Wolfgang. Oehme), Gardening with Water (1995), Gardening with Nature (1997), Architecture in the Garden (2003) and Art in the Garden (2011). Job well done, my friend! Can’t wait to see the next catalog!